Sick of your rubbish bin overflowing? Sick of never remembering to take out your bins? Check out this Arduino powered smart rubbish bin! 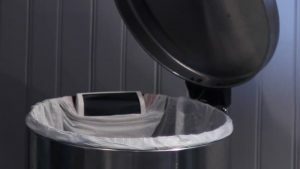 The project allows you turn your bin into an internet of things (IoT) device so that you can keep track of how full your bin is, and even schedule reminders to take your bin out. The bin uses an IR distance sensor to sense the height from the top of the bin to the current rubbish level. This information is then sent to an Arduino which makes a comparison between the current distance and the height of the bin to work out the rubbish level and update a web app (or push data to an existing home automation system). You can even configure your smart bin to tweet or email you when the bin reaches capacity! This would be a perfect project to incorporate into an existing smart home. Love the idea of a smart trash can and can’t wait to get started? check out the Instructable from jsigmier to get started. Want to get started automating your own home? Subscribing to SuperHouse Automation on YouTube is the best place to start! Started on your own home automation project? Inspired by this project? The team at SuperHouse Automation would love to know! Let us know in the comments section below or on Facebook and Twitter.